When it comes to dogs, I’m biased towards the working breeds. 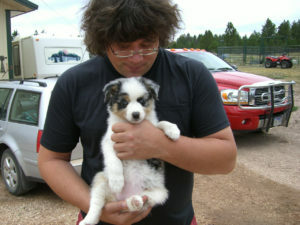 Specifically Border Collies, North American, and Australian Shepherds, and the miniature varieties of these. 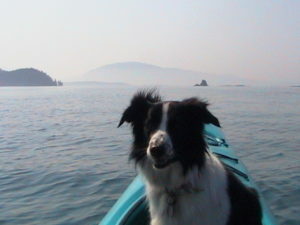 My first was a Border Collie named ‘Fiddle.’ I found her at the Humane Society in Juneau, Alaska, where I was living. I remember being both excited about the new adventure and completely overwhelmed that I was in charge of a life other than my own. 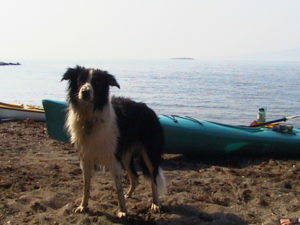 Fiddle was always my sea kayak partner. I’m grateful I had access to an amazing veterinarian who only does house calls, gracious with both time and knowledge, and who taught me everything I needed to know to raise Fiddle in a way that complemented her natural intelligence, curiosity, and disposition. I also had a pal in town who had had several Border Collies throughout his life and who taught me the importance of establishing boundaries and consistencies with dogs, especially working breeds. This is critical if we want pups who complement our own lives and don’t become dominant cost centers of misbehavior. After all, dogs are supposed to add value to our lives, not emotional overhead. Fiddle was an amazing girl but not without a few quirks that I unfortunately had to discover on-the-fly. Those are the risks that come along with the experience of adopting pups that start their lives somewhere else with someone else who may or may not have acted in the best interest of future owners in regards to what I mentioned about boundaries and consistency. There’s no way to know for sure how old Fiddle was when I found her. Maybe 6 months, maybe a year old? In any case, she had no doubt already established an opinion on many things. While most of them were compatible with my life at the time, some of them would not be as time went on. First, and most challenging one, was that, somewhere along the line, she’d likely been abused by a child or children and so made a wide arc around anyone that even remotely resembled one. There were a few others but suffice it to say, getting a pup from a shelter comes with some hidden overhead that may or may not be complementary to our lives and we won’t know it until the pup is home with us. We have to be prepared to accept them and love them unconditionally in spite of these. A little more than a year after Fiddle passed away, I began a search for a breeder. This time I was intending to raise a puppy. I wanted to have the other kind of experience. I’d know the ins and outs, through and through, of my pup because any schisms they had would likely be my own fault. I interviewed almost 40 breeders in the US and overseas until I found the right fit. Meeting Meta for the first time at 10 weeks old. Meta came to me 11 years ago. I raised her with intention right off. I spent our first 3 months together working remotely so I could take her out every hour to potty train, learn to walk beside me, and established lingo and our bond in earnest. So worthwhile. If there’s one piece of advice I would ever be asked to share about raising puppies, it would be to spend as much time as possible with your new pup. If you have to leave your pup crated most of the day or with a boarder often while you work, you might do well to ask yourself if your lifestyle is fit for the well-being of a pup or not. Would you like to live your pup’s life? If there’s any doubt, you might consider erring on the side of waiting until you can afford to spend time to invest in your pup. They’re not accessories. They have hearts, minds, spirits and know well and good when they are being neglected in large and even very small ways. Meta keeping an eye on our front porch. Which leads me to the most recent news. Meta is now 11 and the wonderful centerpiece to our home. She goes pretty much wherever we go and keeps Marielle and I company when the kids are not with us. The kids have wanted a second pup for a few months now and we’ve entertained the idea with them. I think we all knew it was only matter of time before the right opportunity would present itself. Our new pup’s future momma! Well, the opportunity has come. 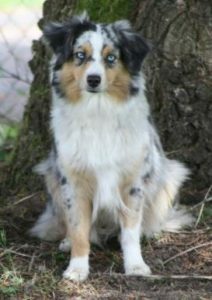 Suddenly, we know a respected breeder who is a fit for us and who is hoping to have a litter in October, which is perfect timing both for us and for puppy training. Fall weather is not too hot and not too cold to spend a lot of time outdoors doing various training exercises. Not to mention, it’s also a great time to take photos of a gorgeous, new puppy against all those amazing fall colors. We have some time between now and then to prepare, think up names, and get excited about our new pal coming soon. What we know is that the pup’s mother is nearly a spitting image of Meta and has an equally distinguished lineage and disposition. Good things ahead. Gratitude to our kiddos for the inspiration to add a new member to our family. You all have such great ideas.